Walt Disney Animation Studios’ “Moana,” the sweeping story of a spirited teenager who sets sail on a daring adventure to save her people, starring newcomer Auli‘i Cravalho as the voice of brave and tenacious Moana and Dwayne “The Rock” Johnson (HBO’s “Ballers,” “Central Intelligence”) as the larger-than-life demigod Maui, has dazzled both critics and audiences. The film earned a 95% critics’ consensus on Rotten Tomatoes and the No. 1 spot at the domestic box office opening weekend. Now, “Moana” sets a new course, arriving to homes on Digital HD/3D and Disney Movies Anywhere (DMA) on Feb. 21, and on Blu-ray 3D™, Blu-ray, DVD and On-Demand on March 7. •	Theatrical Short Film: “Inner Workings” – With introduction by the filmmakers, is the story of the internal struggle between a man’s pragmatic, logical side and his free-spirited, adventurous half. Created by a small team at Walt Disney Animation Studios in a unique, fast-paced style that blends CG and traditional hand-drawn animation, the short explores the importance of finding balance in daily life. 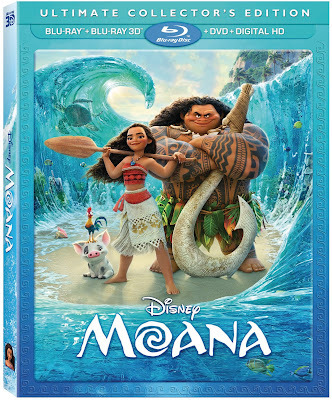 •	Maui Mini-Movie: “Gone Fishing” – When Maui decides it’s time to take charge of the ocean and catch his next meal, Moana must show him the error of his ways … with a little help from her friends! o	Meet the stars of “Moana” in this dynamic Q&A featuring Dwayne Johnson, newcomer Auli‘i Cravalho, and famed animation directors Ron and John. o	Meet the musical team behind “Moana” in this fascinating Q&A featuring Opetaia Foa‘i, Mark Mancina and Lin-Manuel Miranda. •	Island Fashion – Find out how costume designer Neysa Bové took on the unique challenge of creating costumes using materials and techniques native to the islands of Oceania. •	They Know the Way: Making the Music of “Moana” – Musicians Opetaia Foa‘I, Marc Mancina and Lin-Manuel Miranda take us on a personal journey through their involvement in the movie and how it changed their lives. •	Fishing for Easter Eggs – Dive deep into the ocean and fish for the Easter Eggs hidden by the animators at Walt Disney Animation Studios. •	The Elements of … – This series of four mini-docs explores the technical achievements behind some of the ground-breaking effects used in the film. o	Mini Maui – Meet “Mini Maui,” Maui’s tattoo sidekick. Animated by legendary hand-drawn animator Eric Goldberg, we explore how the 2D world collides with CG animation to bring the demigod’s tattoos to life. o	Water – In the movie, the ocean is a character. This piece explores how the water is given a personality, along with the technical feats of creating a believable ocean landscape farther than the eye can see. o	Lava – Te Kā is a creature made of lava, smoke and fire. This piece dives into the challenges of making an animated creature of massive scale brought to fiery life by character, technical and effects animators. o	Hair – One of the greatest technical achievements of the film was the animation of the beautiful, curly hair on Moana and Maui. Take a look at the hair-raising detail that goes into animating each strand, adding performance to the movie that has never been seen before. •	Deleted Song: “Warrior Face” – With introduction by songwriter Lin-Manuel Miranda. •	Deleted Scenes – Ron and John introduce the following deleted scenes: Race the Wind/Ties that Bind; Discussing Moana’s Future; Under the Sea; Grandmother’s Warning/Legend of Maui; Education of Moana; Father, Daughter, Boat; and Canoe Race. •	Music Video: “How Far I’ll Go” – Performed by Alessia Cara. •	Audio Commentary – With directors Ron and John. Rating:	PG in U.S., PG in CE, and G in CF. Bonus material not rated with exception of Inner Workings which is rated G.